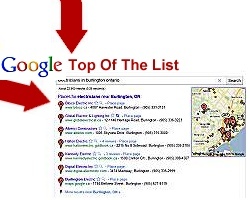 Over 70 Canadian cities and more than 500 Industry categories search results - by city. Are you listed? Top of the List is a National oriented Search Engine Optimization (SEO) website marketing and promotion company. We use a cost effective 7 step SEO process to propel your Website listing to the first page of Google's search results. There is no mystery here. We outline our prices and the 7 step process that will move your small business Website listing up the rankings ladder. After you use our service,consmers looking for your product and service with an Internet search engine will find your business listed. If your not visible then your Website and hosting expenditure is simply a waste of your money.